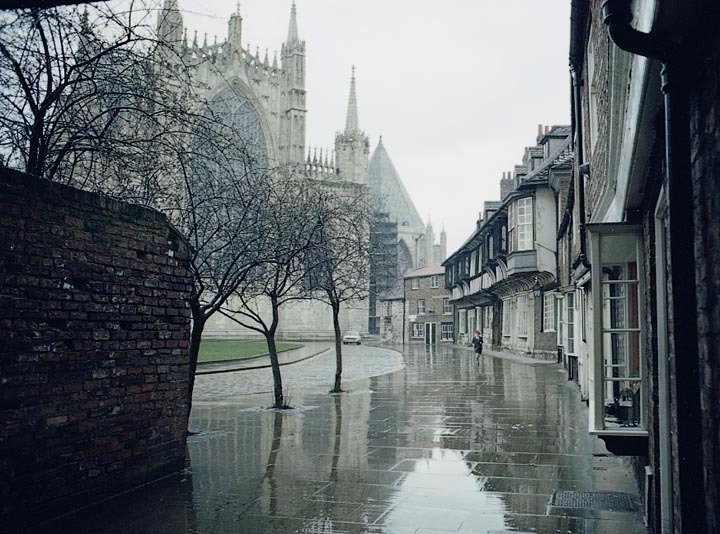 York Minster in the Rain. York. The chapter house is the peaked building at the left of the cathedral. Photograph 1977 by George P. Landow. According to York Minster's own rich website, the cathedral's history can be traced back to a series of early medieval churches, but the present structure began in 1220 when Archbishop Walter de Gray and the Dean and chapter decided to rebuild the Norman minster (damaged by fire in 1137) "on a scale to rival Canterbury." The transepts were constructed during the next 30 years, and the rebuilding continued for 250 years! The chapter decided to replace the nave around 1280, and this worktook more than half a century, in part because of the epidemic of Black Death (bubonic plague) in 1349. Part of the central tower collapsed in 1407 while work on the eastern part of the church continued. During the fifteenth century national politics deeply affected the Minister and its clergy, as did Henry VIII's breaking away from the Catholic church. The Cathedrals's own excellent site, which includes a detailed history, tour, and bibliography.